tech. magazine, the weekly technology magazine from the makers of TechRadar, has also arrived on Google Magazines. Out every week, the magazine can now be bought through the Google Play store and enjoyed on Android smartphones and tablets. Head over to Google Magazines now to get yourself a copy. TechRadar's weekly look at the world of technology is now available on any device, as tech. launches on Zinio today. tech. launched exclusively on Apple Newsstand back in November and for the last six months has been dissecting and distilling the week's technology news into an easy to read interactive magazine tailored for the iPad. Today we're delighted to announce that tech. can be read on any device, so no-one has to miss out. The magazine has arrived on the biggest digital newsstand in the world, Zinio, which can be read on Android tablets and smartphones, Windows 8 devices, Windows PCs and Macs. This week's issue focuses on the Samsung Galaxy S4, with an in-depth review and expert comment on the most talked about phone of 2013 so far. To celebrate the S4's launch, tech. reveals the best handsets in the world today, while also offering insight into Apple's rumour mill and the problem with Android Malware. There's also a look at how Amazon and Netflix are changing the TV game, how Nest is revolutionising heating in the US and what the online world is saying about Twitter Music. Speaking about tech., editor Marc Chacksfield said: "It's fantastic that tech. is now available on even more platforms. The magazine has always been about all aspects of technology, so it makes complete sense that those with an Android or Windows device can now read tech. week in, week out on whichever format takes their fancy." 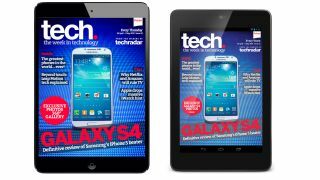 To get tech., the digital only magazine from TechRadar, head over to Zinio now and click download. Or if you would rather get it from Google Magazines, then head over there now. If you have an iPad, then head over to Apple Newsstand now! And watch out for more exciting tech. announcements soon.